This ski-in ski-out unit is at the very best location on the mountain and is in the heart of one of Montana’s finest ski resorts. Just a short walk away is the Base Lodge that links you to 3000 acres (98 trails) where you can enjoy some world-class skiing. The resort is well known for a pleasant lack of lift lines as for its consistently good snow conditions, on average 300 inches a year! 3 floors, 3732 square feet of living space packed with all the comforts of home. 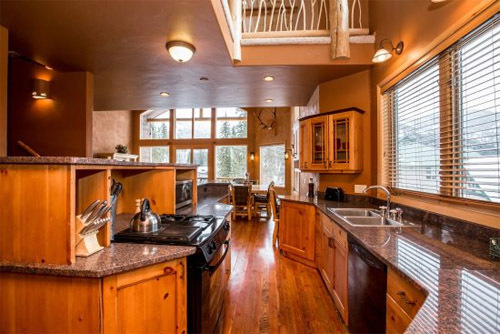 Large windows for ample light and spectacular views plus there is no extra charge for the fresh mountain air. The floor plan is open and inviting. Spacious kitchen with all your appliances and a large dining room table. Finely-appointed living room with gas fireplace and comfortable TV area with large flat screen TV. Master Bedroom has a king-size bed, Flat screen TV and Full Bath. Another Bedroom on this level has a queen-size bed, Flat screen TV and Full Bath as well. The property has a heating system throughout but does not have A/C. Upper level has three bedrooms. Bedroom 3 has a Queen-Size bed, Flat Screen TV and Connects to a full bathroom with a jetted tub. Bedroom 4 has a queen-size bed, flat screen tv and private full bath. Bedroom 5 comes with two bunk beds with 4 twin size mattress, perfect for the kids. There is a half-bath on the main level along with a balcony off of the living room. Laundry room with full-size washer and dryer. There is an attached Cottage to this unit which provides the 7-bed option at an additional cost and can be rented for larger parties. The cottage comes with a spacious living room with gas fireplace, flat screen TV and cozy sofa seats. Small kitchenette that provides you with a mini fridge, microwave, utensils, plates and glassware. This unit has a Master Bedroom with a queen-size bed, flat screen TV and an en-suite full bathroom. The second bedroom has two bunk beds that provide 4 twin-size beds as well as another en-suite full bathroom. With plenty of room for all of your travelers, you owe it to yourself to stay in this gorgeous home! Very easy communication with the team at booking and checkin via text. We loved it, we'll be looking for a similar stay next year.